Description: Show off your colorful cotton candy and protect against airborne debris with this Cotton Candy floss bubble double bubble cotton candy machine cover. 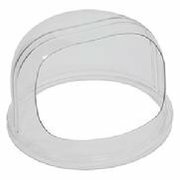 This crystal clear floss bubble cover has a cut out section that makes it ideal for both self serve and full serve cotton candy stands. This Cotton Candy floss bubble simply sits on top of floss bowls with an outside diameter of 26". Because it doesn't clip down, the floss bubble double bubble is best suited for use at stationary cotton candy stands, rather than mobile carts. Requirements: For Use on Cotton Candy Machine Bowls only.